When Kyd was in hospital he missed a whopper of a football game a 7-1 win for Reading at home to Bolton. Kyd has had a season ticket for 7 years now and he has NEVER seen a game like that. He has seen 6 goals and begged for 7 but he's never seen a game where he's been chanting 'We want 8, We want 8'. Alas due to having surgery on the Thursday he could not attend this game and he felt cheated, like he'd hit the beans on toast in a 0-0 tie against Man Utd at the 90th minute... cheated. Luckily we did hear it... BBC Radio Berkshire did a great job of containing their excitement and not squealing down the radio mic (that is a slight mistruth)... So the atmosphere was there, in the empty ward bay we were in, volume up loud and shrieks of joy as we learnt of each goal. So as you can see, all was not lost. A lot more was gained the next day however. Much to the surprise of Kyd and The Hoff, I had a little secret outing planned... if the Doctor's allowed me to steal Kyd away for a few hours that was. I had to beg the doctors and nurses for a pass to escape but at the last minute the surgeon said 'You can go, be careful, don't have too much fun and be back by 7', I was over the moooooon, I had a little secret... that secret was almost out of the bag. So it turns out I had to tell Hoff what was going on as he had to drive over an hour to get from Oxford to Fleet, he happily drove after I told him, when I say happily I mean eagerly and excitedly... but carefully, obviously. Kyd was still non the wiser, Kyd thought we were going to a party, a football themed party. When we got to Fleet we entered a house... who's house?... Non other than Mummy Barrow's house! As we walked in, we were greeted by the most amazing sight. A sight football fans, like us, could usually only dream of. A sight you don't see everyday. THE REAL £1.5m FA CUP... accompanied by 2 lovely, hairy biker lookalikey, security guards. 'It's *long pause* the cup...' he said with a surprised look on his face. 'YEAAAAHHHHHHHH' he said gleaming from ear to ear nodding. 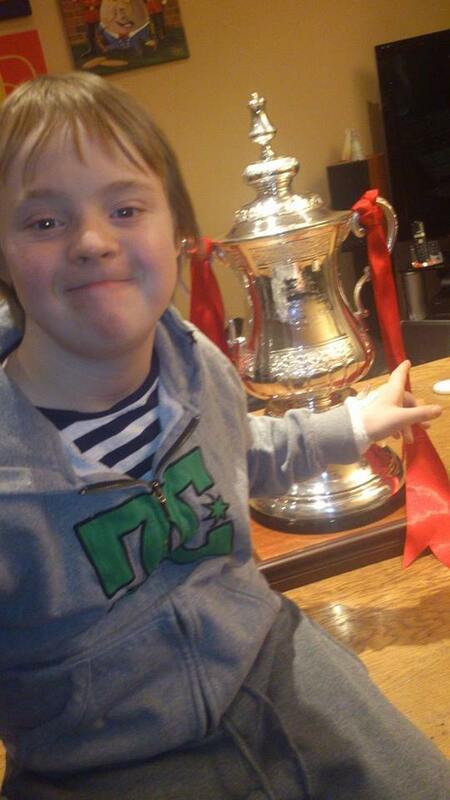 So there he was, sat with his baby brother Rocky, who was desperate to touch the shiny new toy, holding THE REAL FA CUP!!! All the people that have held that cup before him, all his heroes, all the people we watch on the tele week in, week out... all the people most men would love to be. ... in 1995 he did just that! The FA is giving children a chance to make their FA Cup dreams a reality throughout this season’s competition ­ culminating with one lucky fan winning the ultimate sleepover with The FA Cup trophy at Wembley Stadium the night before the 2014 Final. The scheme will give boys and girls around the country the chance to live out the dreams of countless football fans from the Third Round through to the Final ­ with some fans even winning the chance to walk onto the Wembley pitch with the players at The FA Cup 2014 Final. Children and families who enter the competition on The FA Cup Facebook will be chosen at random to win once-in-a-lifetime FA Cup experiences including the chance to win round-by-round sleepovers with the official trophy in their homes overnight and drift off to sleep dreaming of their heroes who have lifted The FA Cup before them. Winners will be chosen at random ahead of Third, Fourth, Fifth and Sixth Round ties. An overall winner will then be selected to win a sleepover with the trophy for their family at Wembley Stadium the night before The FA Cup Final. Kyd was let out of Hospital for a few hours today to do something extra special... Hold the REAL FA Cup!!! The £1.5m trophy of the footballing world in which all of his heroes have held before!! It is stuff most grown men would only dream about. Kyd, with his freshly operated on ACE tube and his cannula still in, got to do what every footballer and fan dream of in their life and do just that from the comfort of a sofa in the living room of a friend... A friend I met only a short time ago but has become an amazing part of my life, a friend who I only know through blogging but who's life is actually more bonkers than mine!! Today Mummy Barrow made this poorly little boy very, very happy and now it's sunk in and others have told him how jealous they are, he's even happier. He's back in his hospital bed sleeping now but still smiling in his sleep. Today dreams were made. Today was a good day. Tomorrow who knows what that will bring but we will always remember today. There were several excited people at the party, some kids, some adults, but for all of them, that day, would go down in history for them all as one of the best of their lives. An opportunity you don't usually get in everyday life. We would like to thank Mummy Barrow and her family for having us round that day and for making memories that we will never forget.